In honor of Social Work Appreciation Month, Project 1.27 shows their appreciation by delivering coffee and donuts for all Mesa County Child Welfare staff members. Additionally, each staff member received a personalized thank you card and a gift card to a coffee shop. The thank you cards were made by the Christian Student Fellowship group at Colorado Mesa State University (CMU). The gift cards were donated by various local coffee shops. 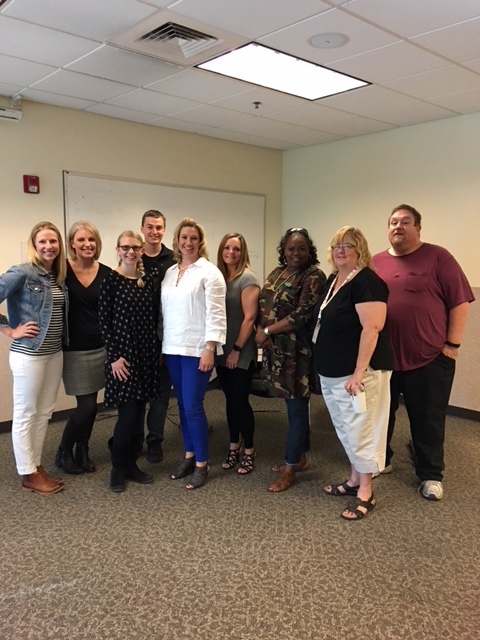 Pictured here: Linde Marshall-Project 1.27, Janet Rowland-CASA, Delaney Santoro-CMU, Matthew Jones-CMU, Megan Weaver- Project 1.27, Kari Daggett- Child Welfare Director, Mona Highline- Project 1.27, Lynette Overmeyer-DHS Supervisor, Dave Downey- Project 1.27. Grand Valley Transit (GVT) staff members taught people how to ride the bus this week. GVT hosts a free class every month that is open to the public, learn more at gvt.mesacounty.us. 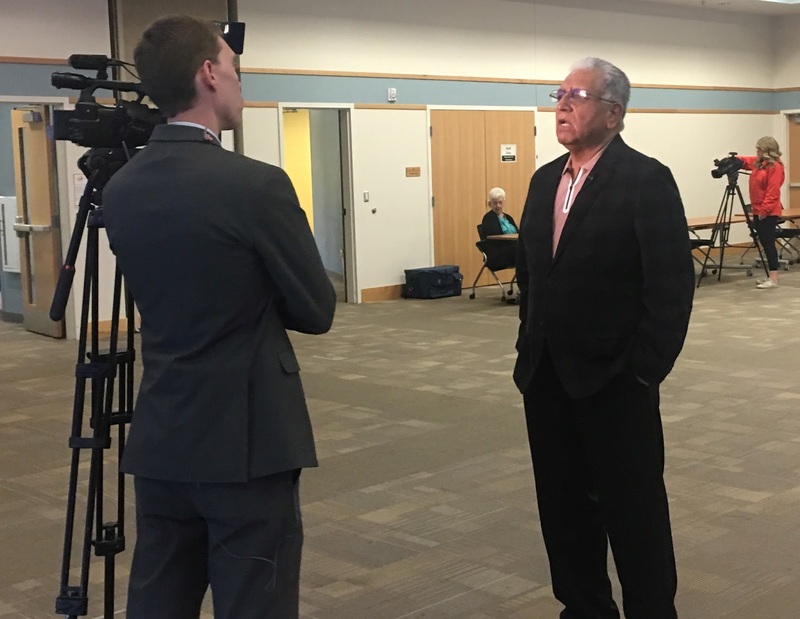 KREX Reporter John Madden interviews Joe Guajardo at the March 27 Suicide Prevention Community Forum Follow-Up. About 30 residents attended the event to learn about the suicide prevention community plan and Western Colorado 211. Mesa County Solid Waste Director Barrett Jensen visits R-5 High School to learn about their compost project. Solid Waste Director Barrett Jensen, center, discusses ways to collaborate with students and enhance composting education and awareness at R-5 High School. School District 51 R-5 High School Principal, Don Trujillo, talks to Mesa County Solid Waste Director Barrett Jensen about the future plans for the school to handle food waste and compost. Information Technology Senior Support Specialists Eric Farslow, front, and David Underwood fix the outside kiosk screens at the old Mesa County Courthouse. The Board of Mesa County Commissioners hosted a Tri-County meeting to talk to commissioners and administrators from Delta and Montrose counties about issues that affect the Western Slope. Montrose County Government Affairs Director Jon Waschbusch discusses legislative issues that may affect Montrose and Mesa counties with Commissioner John Justman. Mesa County Commissioner Rose Pugliese talks to Montrose County Commissioner Keith Caddy about airport issues in rural Colorado. Elected officials and executives from Delta, Mesa and Montrose counties discuss the Grand Mesa Uncompahgre and Gunnison (GMUG) Forest Plan, intergovernmental and non-profit funding, Bureau of Land Management headquarters relocation and the Outdoor Retailer Trade Show. Mesa County Clerk and Recorder Sheila Reiner and Commissioner John Justman catch up on Wednesday morning. Here is a sneak peek at the construction happening in the Mesa County Building and Planning departments. 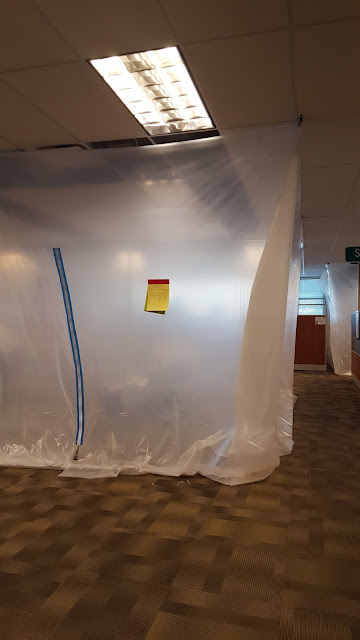 A new enclosed conference room is being built, while another is being remodeled. 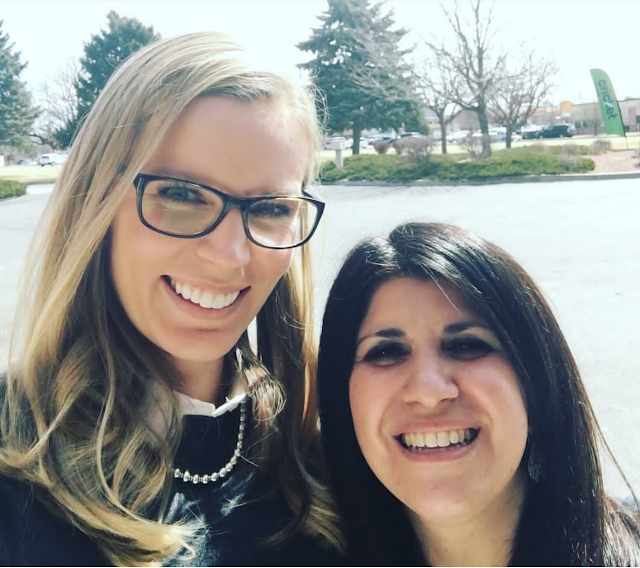 Proper permits were pulled for the construction of the conference rooms at the Mesa County Central Services Building, 200 S. Spruce St.
Grand Junction Airport Director Angela Padalecki and Mesa County Commissioner Rose Pugliese pause for a picture after discussing airport priorities. Department of Human Services (DHS) Purple Team: Traci Weaver, Ana Noriega, Michelle Boyd, Lyndee Kees, Kim Petek, Becky Foreman, Lindsay Bullock, Jessie Ruggiero, Connie Atencio, has hosted breakfast once a month to raise funds for clients at STRIVE. Since April of 2017, they raised $245.25. They made 48 baskets this year from the proceeds. 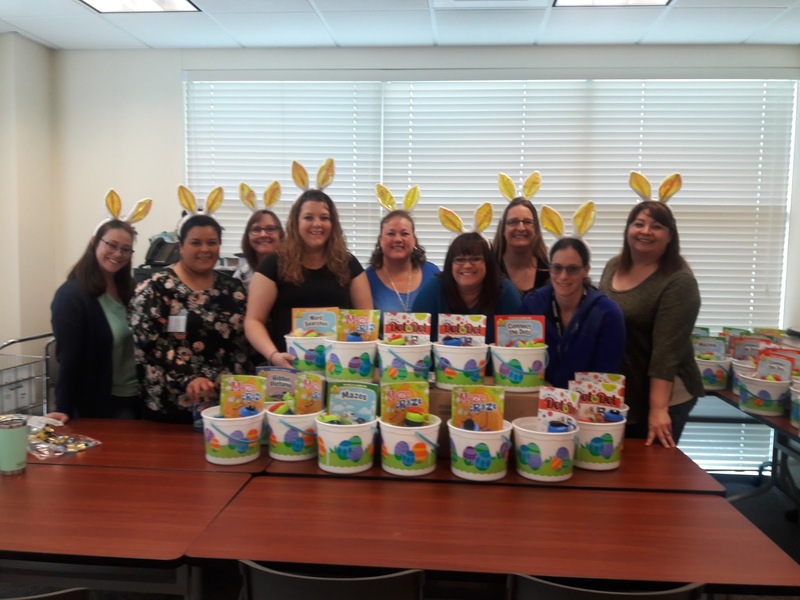 The DHS Purple Team put these Easter baskets together, which are delivered by a STRIVE case manager when they conduct home visits. STRIVE is a partnership of people supporting people, and it is their mission to help people with developmental disabilities live independent, productive and full lives. 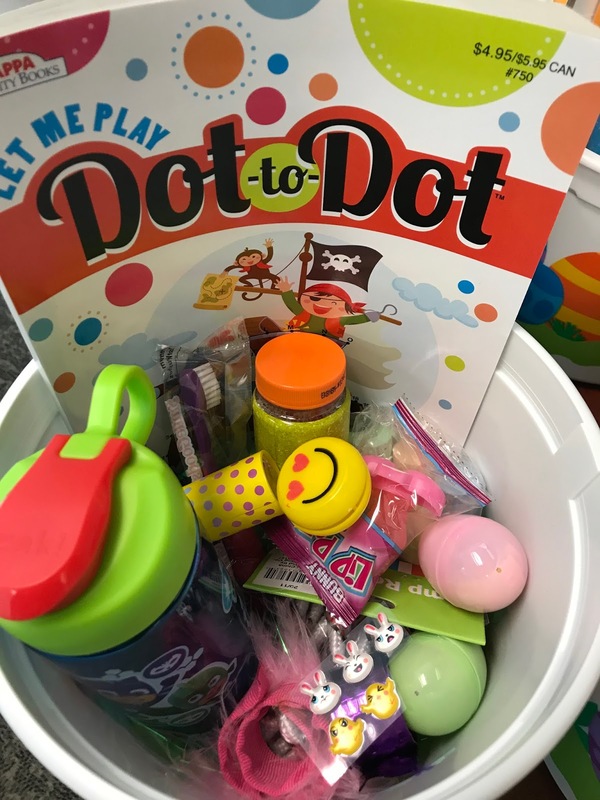 Donations are welcome at any time, please contact DHS Eligibility Specialist Lyndee Kees to donate. On Tuesday morning, many residents testified in support of Absolute Prestige Ranch Events Conditional Use Permit at a Land Use Hearing. 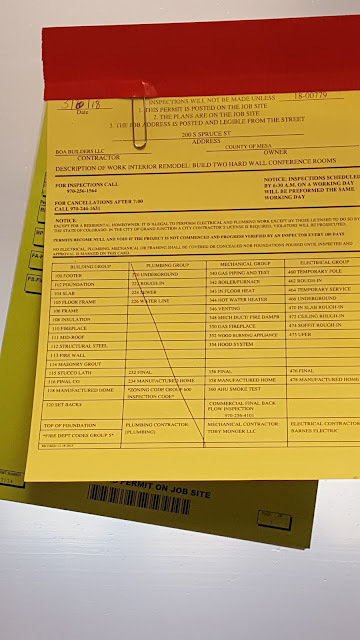 The Mesa County Commissioners approved the permit with conditions, to see the resolution, visit http://sire.mesacounty.us/sirepub/cache/2/ogvzo4vlznbiy5rrzv2tnsek/2607785003292018033035369.PDF. The new employee parking lot at the Mesa County Sheriff's Office is now open. Mesa County Landfill is implementing a pass system to provide a one-time free day for residents. One pass will be issued to each household annually and must be used within two weeks. 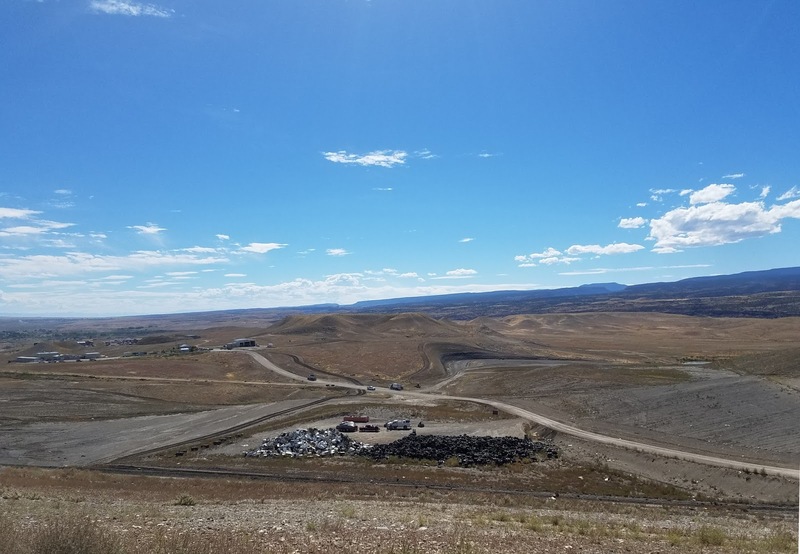 Each pass will allow the pass holder one free load at the Mesa County Landfill. Special Waste such as tires, appliances with Freon, electronics and household hazardous waste are not included with the pass. For more information, call 241-6846. Watch this clip for details: https://goo.gl/RZdrfh. KREX Reporter Brandon J. Thompson interviews Commissioner Rose Pugliese regarding illegal gambling in Mesa County. Pugliese testified before the state legislature a few weeks ago in support of HB18-1234, Internet Sweepstakes Café Revise Legal Terms, concerning clarification of the laws governing simulated gambling activity.